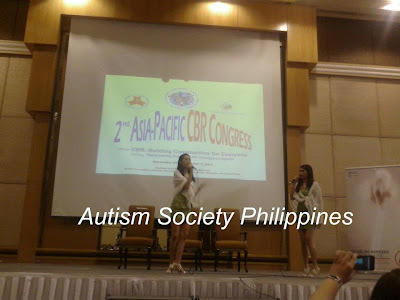 ASP Dream Girls, Thara Marie Santiago and Danica Escasiñas, entertained and wooded the almost 600 participants from 65 participating countries with “Can You Read My Mind” during the first day of 2nd Asia-Pacific CBR Congress in Sofitel Philippine Plaza, morning of November 29, 2011. Many were surprised to find out that the young women have autism and they quickly posed with them for photos during the break. 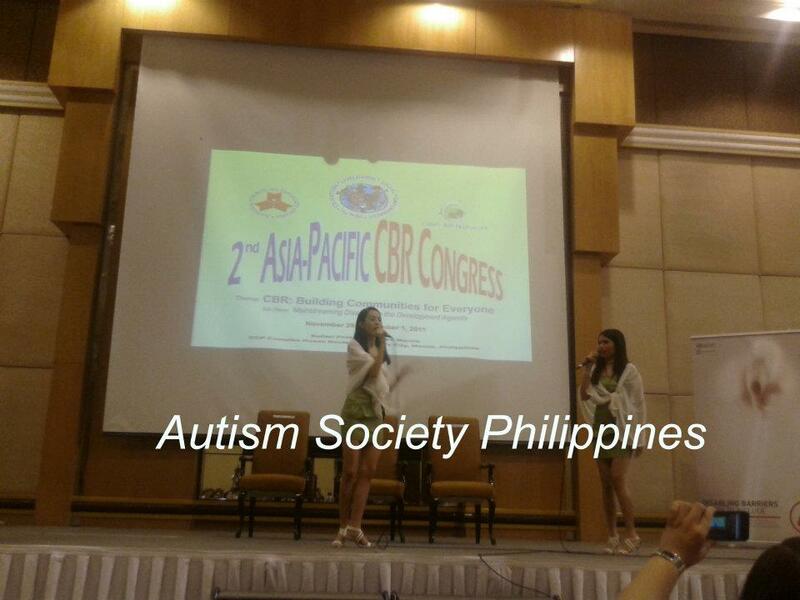 The girls also led singing the Philippine National Anthem, which was an impromptu request from National Council for Disability Affairs OIC, Dir. Mateo A. Lee, Jr.
“Sana po President, matulungan niyo po ang mga taong may kapansanan, mabigyan po sana silang trabaho,” came the very touching message came from Ms. Emmary Perez, a female child with visual impairment. Filipino PWD participants seated in the audience applauded her simple, but direct to the point message. The President shook her hand and proceeded to make his Keynote Address. Click here to read. 2. Relevance of CBR for the Asia-Pacific Region by Ms. San Yuenhaw, United Nations Economic and Social Commission for Asia and Pacific. But in the afternoon, ASP Board Secretary, Tiffany Tan and this author chose to attend the “Gender Equality among Persons with Disabilities”. This topic, among the other concurrent sessions presented, seem to be more relevant, as issues on women with disabilities, were rarely discussed. Topics presented were Empowering Women with Disabilities through Information Communication Technology (Bangdalesh Experience), Inclusive Children Parliament (India’s Experience) and Creating the Voice of Women with Disability in Every Community (Tahanang Walang Hagdanan, Philippines). Such as the ASP Dream Girls experience of wanting to improve their talents in singing, their families bonded their resources, including their mentor, to help the girls undergo voice training lessons. One of the girls has already applied for a College Scholarship for a degree in Music and was accepted. Uninformed parents lack information of existing laws protecting PWDs, especially girls from abuse, and where to get help and assistance. While ending the day with coffee and sandwiches, I sincerely hoped and prayed that someday, somehow, ALL the rights meant for our PWDs will be fully implemented with 100% support from the government and the public. I was glad to find out that on the third day of the congress, Gender Perspective is considered in all CBR Activities, as collectively recommended by the members of the Asia-Pacific Congress in Manila.Click here to read more.